Facebook has been hyper-focused on ensuring that content posted on the platform is used to engage the public, not misinform them. Just this week, they announced a multitude of new features to help mitigate the degree to which hate speech, offensive content, and “fake news” gain exposure in News Feeds. After over a year of controversies, steps like this had to be taken to restore faith and trust in Facebook – not just for users, but for advertisers as well. At the end of the day, Facebook is a business and needs to generate revenue. If their advertisers are skeptical of running campaigns on the platform due to concerns over what content will appear alongside their ads, that is a huge problem for Facebook. While the measures Facebook is taking to reduce harmful content sitewide are a step in the right direction, more needs to be done to restore advertisers’ confidence in running ads on the platform. The trouble here is that “brand-safe” content can mean many different things to different brands. For some, it can mean not wanting ads to appear on any content with profanity or otherwise mature themes, while others may be fine with mature language, but not want to show up for anything with debatable social issues. And finally, some brands don’t have an issue with any of these, and just want to get as much reach as possible for their target audience. So, to make Facebook more “brand-safe” for all advertisers, there need to be different options presented. To offer these options to advertisers, Facebook launched a new “Inventory Filter” this week. 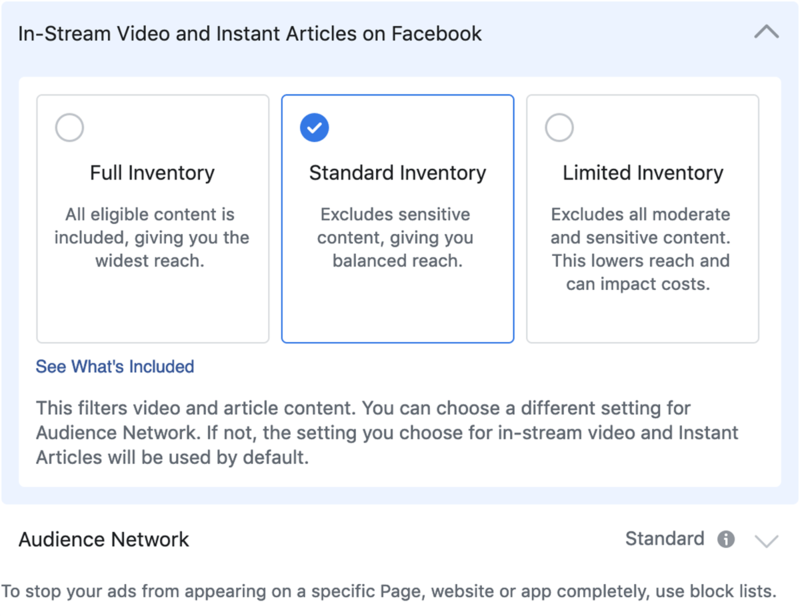 This feature allows advertisers to select how much or how little Facebook limits an ad’s inventory options based on what they consider to be “brand safe” for their audience. The Inventory Filter is going to slowly replace the Exclude Categories feature, which allowed you to choose specific topics you don’t want your ads appearing on. Limited inventory: Maximum protection against any potentially offensive content. This option will also have the most impact on your ads’ reach potential. Standard inventory: This provides moderate protection against flagged content, but isn’t as restrictive as the limited offering. This is what the default setting is on your ads currently. Full inventory: Minimal protection and ads may be delivered to all eligible content. This option will get you the most reach for your ad spend, but it does run the risk of your ads showing up on potentially undesirable content. Of course, all content on Facebook must uphold Facebook’s Community Guidelines, so you know that your ads won’t show up on any content that wouldn’t be allowed on Facebook regardless of the option you select. This new feature opens up options for advertisers who are very sensitive about ad placement, while also catering to brands who don’t want to be limited. It gives more power to advertisers to decide what works for them, and takes the blame off of Facebook when their definition of “brand-safe content” doesn’t match the advertiser’s. As more brands turn to social media to advertise, we’ll likely see more features like this be introduced to allow advertisers to customise not just their audience, but where they’re showing up. When there is a controversial television show or talk show host, advertisers tend to pull their support by not running commercials during the program. Big brands now have this expectation for their marketing efforts on social media channels as well. This is especially relevant in cases where content creators get a fraction of the ad revenue since the advertisers are inadvertently supporting that individual when they didn’t explicitly sign up to do so. I expect to see more platforms roll out advanced features like this, and also anticipate that as the years go on, we’ll see these ad placement options become even more advanced over time.